We are having a stretch of amazing weather on the Mendocino Coast and lots of exciting things going on. 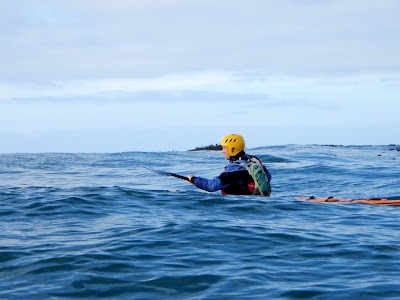 Jeff and I just completed our first sea kayaking instructional week on the Mendocino Coast. Actually, I did the organizing for this one and Jeff did the teaching as I was taking a lifeguarding class at the Fort Bragg Recreation Center (yes, I am now a certified Red Cross Lifeguard). 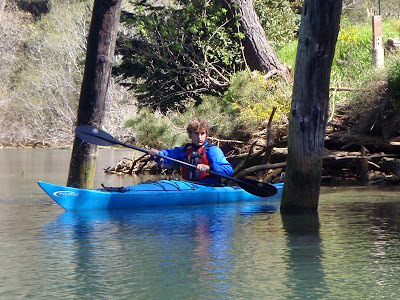 We are building our sea kayaking instructional program here on the Mendocino Coast and are encouraged by the progress and positive responses of our clients. We feel so lucky to have the flat, calm waters of the Noyo River to teach basic skills and then an exciting coastline to teach coastal skills, sea kayaks in the surf, and our favorite - rock gardening. 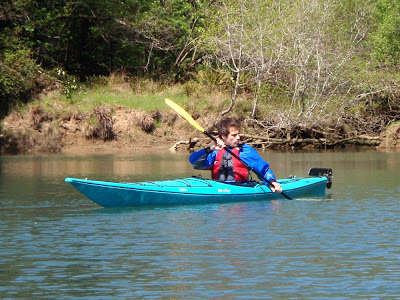 We are continuing to run our flatwater sea kayaking classes and tours from Dolphin Isle. It is protected from the wind and there is so much wildlife activity that we sometimes have to pause during our instruction to view the birds or river otters and their antics. On Tuesday, we saw both an Osprey and a KingFisher dive for fish in the river just in front of us. Our location for coastal instruction varies, but the Noyo Bay and the Fort Bragg stretch of the Mendocino Coastline continues to be our favorite. The bay is easily accessible, rich with wildlife, and offers a progression of paddling challenges which are great for teaching and learning. Speaking of training, Jeff just completed a wilderness first aide class so we both have the most current and up to date first aide and cpr training and certifications. Between our classes and tours and other business happenings, we are training to further develop our own kayaking and guiding skills. The coastal fog yesterday morning gave us practice navigating in the fog. Today a swell increase will send us to the surf zone. Wahoo!!! Sunshine and surf are two of my favorite things!